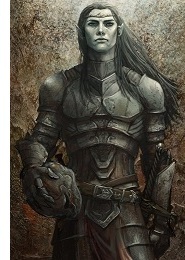 Eöl the Dark Elf - All that is known about Eöl's background is that he was a Sindarin Elf related in some way to KingThingol. But he was a loner who did not enjoy the company of his kin. And when he gazed upon Aredhel who had strayed into the forest that he claimed for himself, he was immediately smitten by her beauty. Though they were complete opposites, they fell in love and married. But their differences would cause strain between them.